Who knew Roland makes audio interfaces? We test the company’s top-of-the-range Rubix44. It should’ve been cubed-shaped, though, surely? Roland, let’s be honest, is more famous for its synths than its interfaces. The company produced keyboards that defined much of 80s synth pop, and then (rather accidentally) defined dance music with its 303 Bass Line, which was designed more as a bass accompaniment than a squealing acid-music backdrop. Then there are the company’s drum machines and, again, the TR-808 and 909 still provide most of the beats and backbone to dance and have done for three decades. So, indeed, who knew that the company makes interfaces? However, not only is the company’s latest interface, the Rubix44, a well-spec’d and sturdy unit, it comes in at a shade under 200 quid street price, putting it firmly within reach of most of us. So exactly how good is it? Rubix44 is a 4-in, 4-out USB interface that feels properly pricey with an all-metal construction and a very solid build. 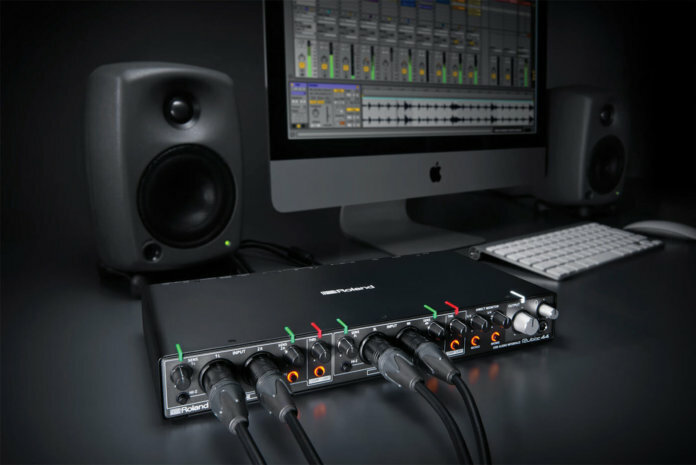 It’s wide and will take up a lot of space on your desktop compared to other similarly priced units – recent PreSonus, Tascam and even UA interfaces that we’ve tested feel tiny in comparison. But that’s because Roland hasn’t held back with connectivity options and loads of rotaries and switches. 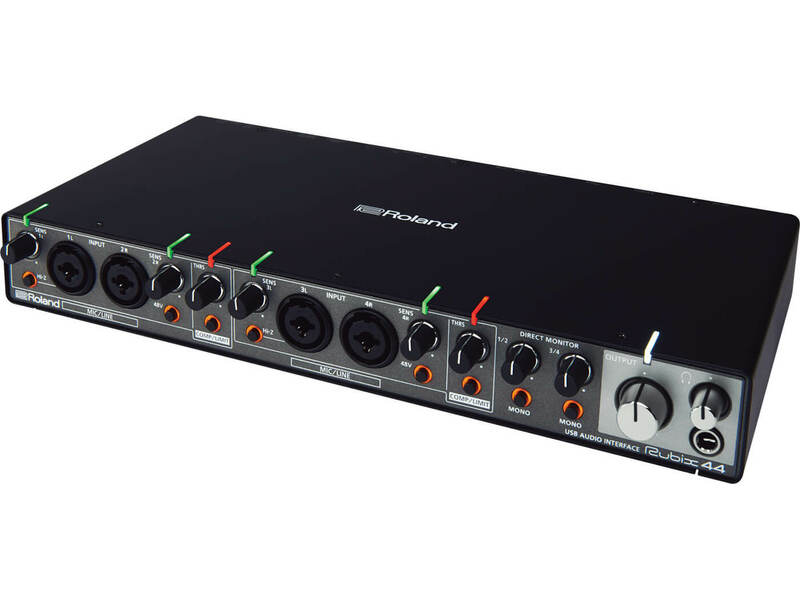 It has four combo XLR/jack inputs in two pairs around the front, with one and three Hi-Z switchable to take high-impedance inputs from instruments such as guitars. There are also +48V phantom power options for condenser microphone input. As well as input rotaries for all four inputs, there are controls for the useful built-in compressors on both pairs of inputs, separate monitor controls for both pairs of outs, plus an overall level control and headphone out to the very right of the unit. to select between compressor and limiter, headphone source, loopback and ground lift. Loopback allows you to mix the input source with the computer audio and loop it back to the computer – useful for live internet broadcasting. Ground lift combines with the interface’s extra shielding to deliver a quieter operation when out and about in busy live arenas. You’ll want to have this switched off in normal operation, as I found engaging it actually caused a buzzing. Finally, a set of level indicators show whether your signal is good (green) or too high (red), and each button option around the front illuminates with a nice orange glow when selected. Rubix44 is the biggest in the Rubix range of interfaces and has two smaller siblings (the 22 and 24) that can be buss powered. Sadly, this isn’t the case with the 44, making its mobile connectivity more limited, simply because it’s tied to DC power. However, in the studio it can still be a great option to record with if you’re switching between iOS and desktop environments. With its connections, it’s clearly aimed at singer-songwriters or even small bands, so is ideal for several recording scenarios – everything from the aforementioned web blogging to simultaneous four-part live recordings. Finally, bundle-wise, Rubix44 comes with Ableton Live Lite… and nothing else. 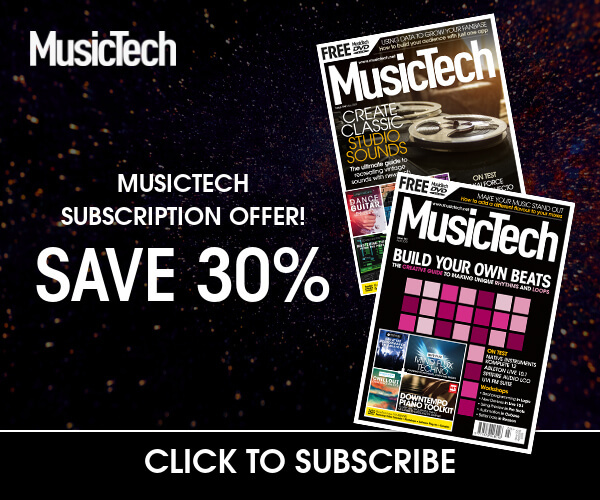 I know you shouldn’t buy an interface on the strength of its software bundle, but that might still seem tight, and is put in focus as I have just reviewed a new Audient interface that came with software worth almost as much as its asking price! If you have any trouble getting Rubix to talk to your Mac, PC or iPad (by way of an optional Lightning-to-USB connector), then there are useful Quick Start videos on the Roland website (complete with earworm music that will stay with you for too long) but, in truth, you shouldn’t require them. I had it up and running with Logic in just a few minutes, with the software picking it up in Preferences straight away. So to the first part of my test, and I always play a series of mixes I’m working on, plus older ones that I’m very familiar with, to gauge the sound of an interface. The Rubix44 certainly sounds true, rather like a good pair of speakers sounds flat – at first you think it lacks bass, but I believe it’s accuracy that I am hearing rather than a lack of lows. The important point is that you can hear everything across the stereo field and pick out all of the detail. This makes it good for mixing, but it doesn’t achieve that rare feat where the sound is both accurate and inspiring. The stereo field feels a little enclosed – not narrow – just not laid out before me quite like my reference interface. But, again, that one is £499, so a little perspective has to be noted here when you consider that price difference. Next up, I run some well-mixed tracks from my favourite artists through the interface and, again, feel it to be accurate and flat. It does a great job, and just gets on with it, with no nonsense. For the final test, I plug my usual gamut of instruments through the inputs to check out the mic pres and the benefits of the onboard compression, and I have to say, this is where I start to get really impressed, especially with the low-noise performance. I try a slightly wild electric piano and record it with all of its attitude, then tame the sound with the compressor/limiter. As Roland says: “Rubix44’s built-in compressor/limiter provides peace of mind in the heat of a recording session,” and I can’t argue with that – my signal always seems under control or at least control is within easy reach. Around the back, you can switch between two types of compressor and a limiter. With the former, increasing the dial increases compression and raises the make-up gain, whereas the limiter suppresses volume. That’s more flexibility than I’m used to, especially at this budget. Next up, vocals – and the mic pres exhibit a similar richness and clarity, again with the flexibility of the chief compression whip on hand in case you need it. For vocals, this is best realised by switching to Comp 2, which has a shorter attack time. Next up, vocals – and the mic pres exhibit a similar richness and clarity, again with the flexibility of the chief compression whip on hand in case you need it. For vocals, this is best realised by switching to Comp 2, which has a shorter attack time. Acoustic-instrument detail tests the mic pre’s detail, especially in the higher end, but they deliver – the inputs on this thing really do sing. I also love the very obvious green for ‘go’ LED above each input which turns to red for ‘bloody well turn it down’ when you push them too hard. If you were to pick up the Rubix44 in a shop, feel the quality, switch it on and try it out, you’d expect to pay a lot more for it. There are more inspiring-sounding devices, but they cost significantly more. If you’re on a limited budget, but still need quality, I’d have no hesitation in recommending Rubix44. The additional features, the flexibility, the transparency and sheer physical presence make it potentially the interface bargain of the year. Interfaces designed to be both desktop and iOS compatible have to be sturdy, and Rubix’s big plus is that it is just that. We’d probably recommend the smaller buss-powered members of the Rubix family for mobile use, simply because of that power flexibility. However, for an easy to use and fully featured interface, Rubix44 makes for a very decent desktop companion with a very clean sound. 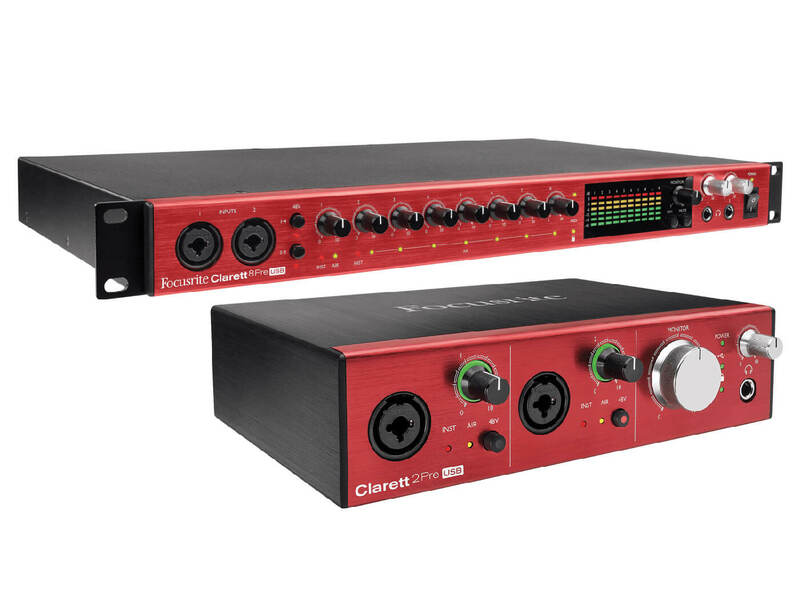 You’re paying more for these to get the equivalent connectivity but Focusrite interfaces always boast a great sound and feature set and these are no exception, with a good software bundle thrown in, too. Rubix44 is a fantastic, great-value interface that comes with a top range of recording options for the cash. Roland does do interfaces!